3. DMV sys.dm_exec_query_stats; plan_generation_num Column. As the scope of our article is not detecting SQL Recompilation but find the reason for recompilation I am not going to detail on the above more. I am listing Type of event subclass. Indicates the reason for recompilation. 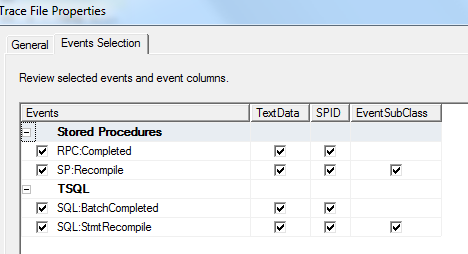 SP:Recompile, RPC:Completed,SQL:StmtRecompile and SQL:BatchCompled eventsto the trace. Note:- The event subclass shows Deferred compile because the object #Temptbl is not available during compilation. But the most common way an SP gets recompiles is for EventSubClass:Statistics Change which I have not dealt in the above example. I will be writing a separate article on Temporary table and permanent table Cardinality and Recompilation where I will explain in detail. This article is intended to show how to find why SP or SQL batch are recompiled. 2. Use SHOW_STATISTICS consistency checker.